Schluter Ditra Floor Warming System- StoneTooling.com. DITRA-HEAT is the only system that provides floor warming and uncoupling in a single layer. 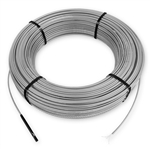 The heating cables are easily snapped into place on top of the uncoupling mat with no clips or fasteners. 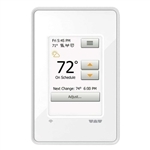 The DHERT102/BW is a programmable digital touchscreen thermostat designed to control the Ditra-Heat heating cables. With DITRA-HEAT, your floors can combine the beauty of tile with the comfort of an electric floor warming system to bring a touch of luxury into any room of the home. 134.5 ft2 roll. Schluter-DITRA-HEAT-TB is the newest electric floor warming system with integrated thermal break from Schluter.